You may have heard of a new trend called standing desks. They’re certainly not new by any means – Winston Churchhill used a standing desk, and so did Leonardo da Vinci and Ernest Hemmingway – but they’ve been gaining in popularity recently. It’s becoming more well known that sitting down all day is bad for your health. So bad, in fact, that exercise can’t even negate the effects of sitting all day. 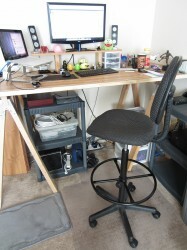 With that said, I probably scared you enough that you’re wanting to give standing desks a try, but where do you start? First off, it’s critical to point out that a proper, professionally-built standing desk can cost well over $1,000, with the cheapest models costing at least $500, so if you’re wanting to get one without spending a lot of money, prepare for the DIY method. Plus, you don’t want to go out right away and spend $1,000 on a standing desk when you’re just wanting to give it a try. The most important things to remember when trying out standing desks is to ease into it and don’t spend a lot of money. In fact, find a countertop or other standing desk-height surface that you can essentially “practice” on to get a feel for what standing while working feels like. You won’t be spending any money at all, but you’ll still get to see what it’s like — sort of like test-driving a car that you might want to buy. Once you’ve officially decided that you’re all-in with a standing desk, it’s time to find one to build (that is, if you don’t want to spend a lot of money). Personally, I swear by the sawhorses and door desk, which essentially is just two sawhorses with a door laid across them to make a desk. From there, you can sand down the door, stain, and seal it to make it look nice. 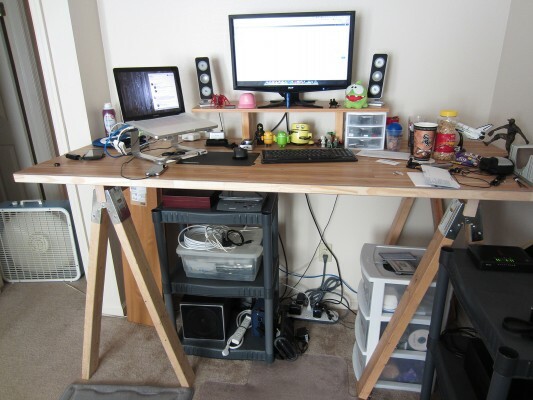 However, there are literally tons of other ways to make a standing desk, and you’ll no doubt find a DIY project that fits your budget and your style. You can make a desk out of various Ikea parts, use metal piping with a piece of butcher block, or just put some paper reams under the legs of a regular desk to make it standing height. 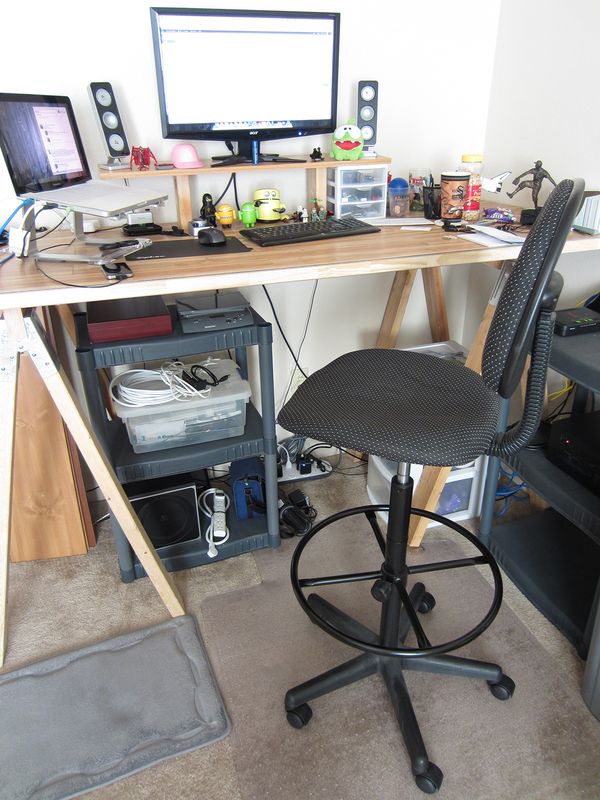 Before you measure and cut, though, it’s important to build your standing desk so that it’s ergonomic to your body. Most importantly, the height of your standing desk should be elbow height, so that when you type on your keyboard, your arms bend at a 90-degree angle. Your monitor should also be propped up on a second shelf so that it’s at eye level. However, before you go standing all day long, it’s important to note that standing all day is just as bad as sitting all day (just with different effects). Standing all day can cause things like varicose veins, so it’s all about moderation; stand for a while and then sit for a little bit. I usually like to stand for a couple of hours and then sit for a half hour or so, and then repeat that until the work day is over. This is where something like a drafting stool can come in handy, but if you get one of those fancy electric standing desks, you can adjust the height easily whenever you want. What if you work in an office that doesn’t allow standing desks? That sounds like a silly question, but many companies like their office buildings to be uniform and everything consistent, including the desks; a standing desk would pop out like a sore thumb in an office building. So, if you can’t get a standing desk, don’t sweat it. One of the main reasons for a standing desk is movement, so if you don’t have a standing desk, just make sure you get up out of your chair every half hour or so and walk around for a few minutes. Standing desks simply get you moving, and you’re a lot more likely to start walking around if you’re already standing up.